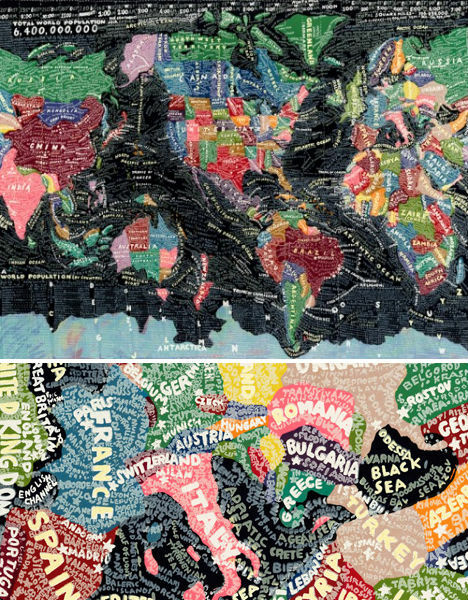 Maps aren’t just two-dimensional pieces of paper depicting the locations and geographic features of the world. 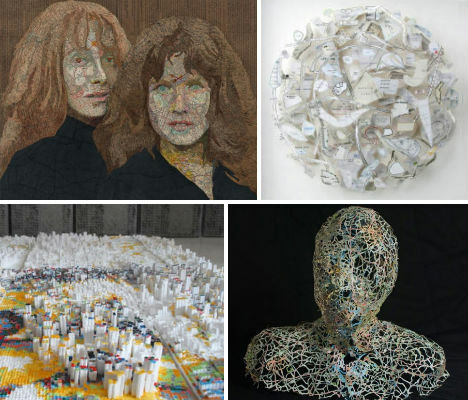 They’re the basis for portraits, sculptures and clothing, and are reconstructed or reimagined by these 15 artists in the most curious ways – whether recreated solely with typography, dissected and rearranged or used to illustrate information that can be humorous or disturbing. Touching and, at times, hilarious, these keyword maps by R. Luke Dubois associate each town with the terms most often used by locals to describe themselves and their desired partners on their online dating profiles. 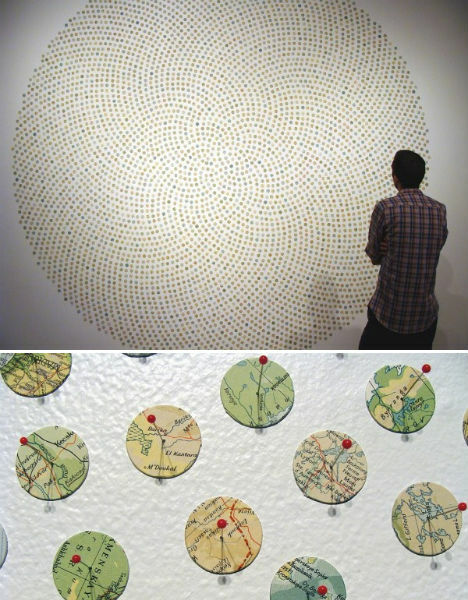 Dubois joined 21 dating websites and analyzed the language used in 21 million profiles to come up with the data, which was then displayed on maps. 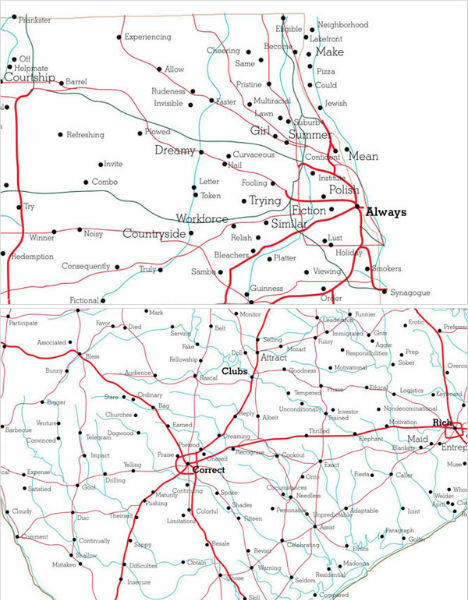 Chicagoans say things like “prankster”, “pizza”, “smoker” and “synagogue” while Central Texans are all about “churches”, “boundaries”, “barbecue” and “Madonna” – the latter presumably referring to the Virgin, not the pop star. 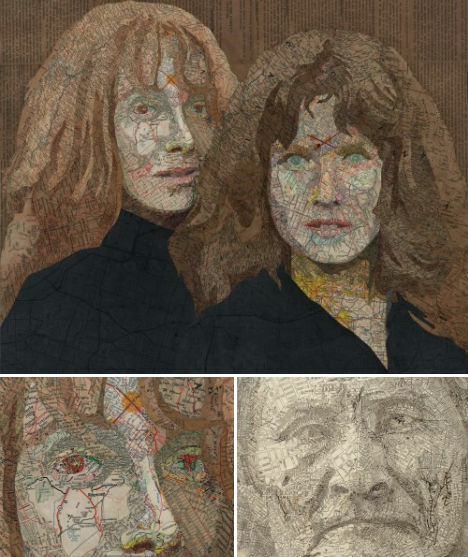 Nothing but text – and, in some cases, dreamy splashes of watercolor paint – make up these hand-crafted world maps by Chicago-based designer Nancy McCabe. So minimalist, and yet there is so much to see – you’ll find yourself reading the names of cities which pop out with new clarity against their stark background. The First Apple series by Ramón Espantaleón is a tribute to New York, particularly in light of the upcoming 10th anniversary of the 9/11 attacks. Espantaleón recreates scale models of the cities in clay, painstakingly constructing each building at 1/65 scale, before using them to cast silicone molds which can then produce recreations made of epoxy resin and polyurethane. 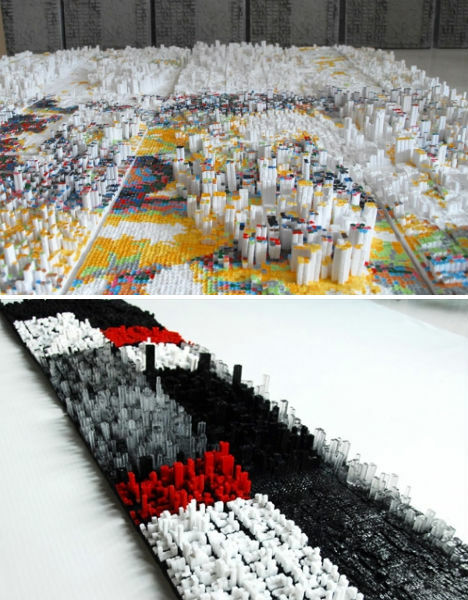 Espantaleón, a Madrid native who lived in New York on the day the World Trade Center fell, places these pixelated city blocks onto representations of the Twin Towers. 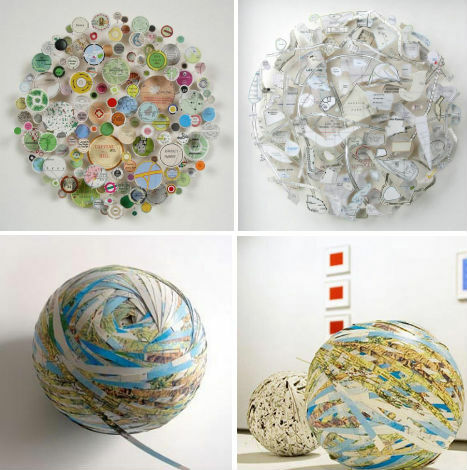 Like meaningless maps for the obsessive compulsive, these works by Armelle Caron take the components that make up a city and lay them out according to size for a more tidy-looking result. 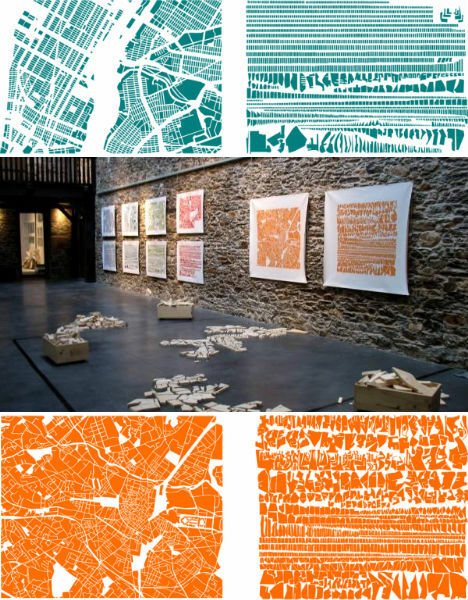 The French artist displays the original maps alongside the decontextualized shapes, also providing wooden cut-outs that can be arranged by visitors. 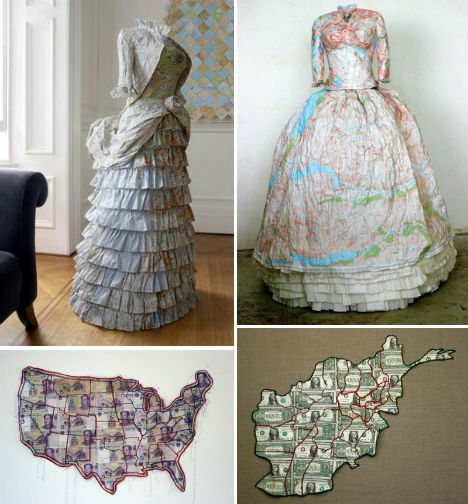 Elisabeth Lecourt of France created this series of children’s clothing called ‘Mapquest’, with vintage styles crafted from folded and cut maps. Is it any wonder that some typophiles are so obsessed? 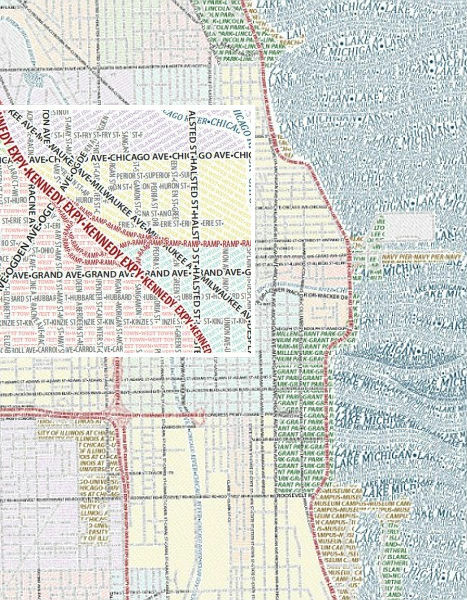 Typography, often beautiful and evocative in itself, provides the basis of yet another map, this one of Chicago, created by Axis. Thanks to the colors chosen for various elements, from afar, they look like normal maps, albeit with a bit of artistic flair in the wavy sea. This is one transmit map that you’d likely be more than happy to frame and hang on your wall. 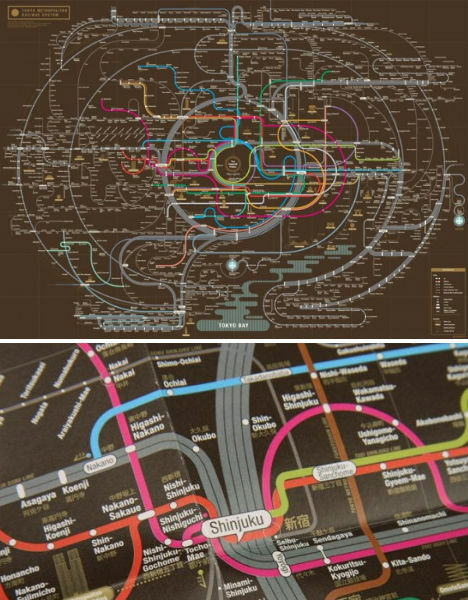 Seoul graphic designers Zero Per Zero create colorful abstract compositions of the metro systems in Tokyo, Osaka, New York City and other cities around the world. 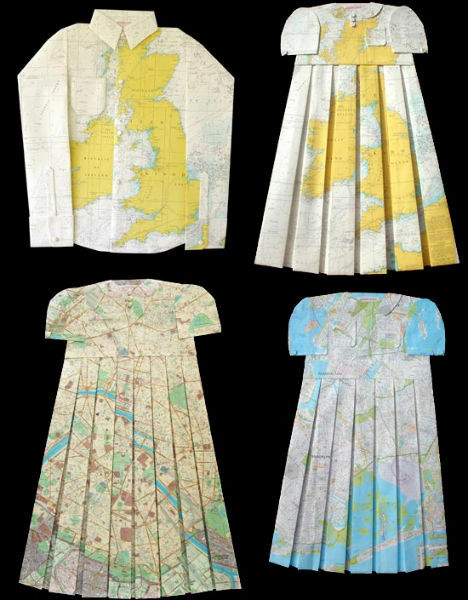 UK artist Susan Stockwell uses maps to craft stunningly detailed dresses, often with political implications; the dress on the left is ‘Empire Dress’, a Victorian style created with maps of the British Isles, while the right-hand ‘Highland Dress’ depicts a traditional Scottish style made with maps of the Highlands. 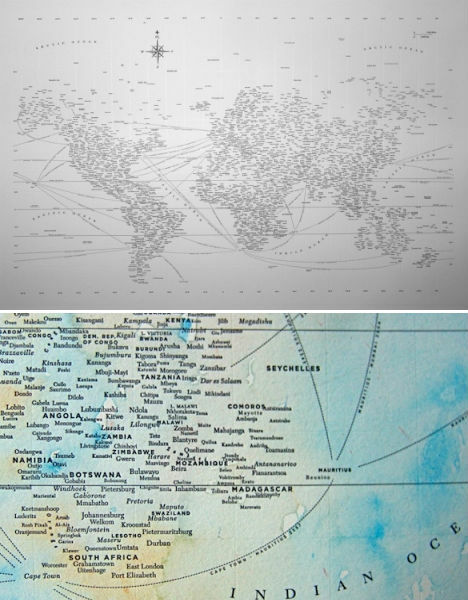 Stockton also creates ‘money maps’ including ‘America is an Imperial State’, left, made with Chinese yuan, and ‘Afghanistan – A Sorry State’, made with American dollars. 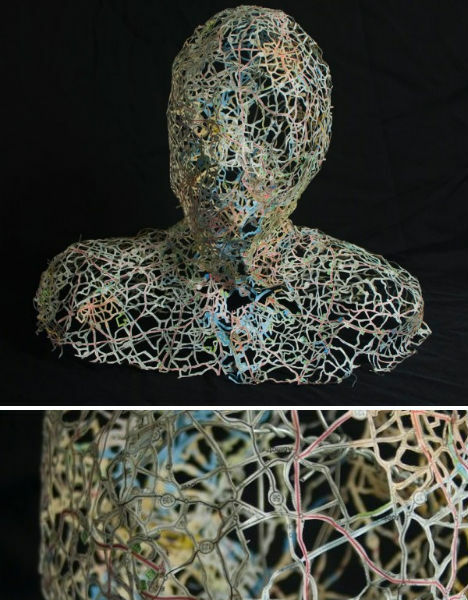 Chris Kenny fashions scraps of maps into complex three-dimensional forms, reducing entire continents to strange shapes hung on a wall or turning flat images of the world into globes. Kenny says he replaces “the cartographer’s logic with an absurd imaginative system. 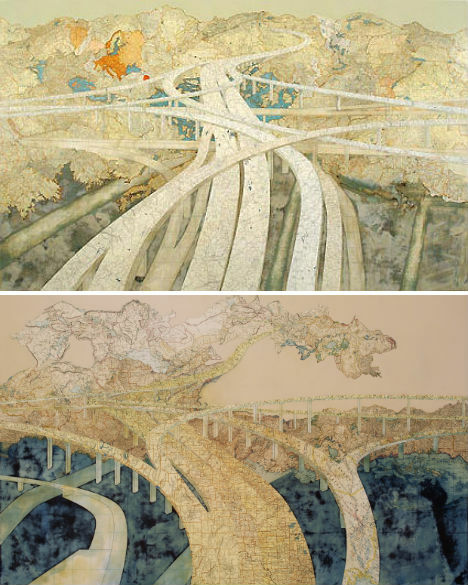 The roads float and interact in unlikely combinations that allow one’s mind to ricochet back and forth between disparate locations and associations."